(MoneyWatch) Lately, for fun, I've been reading the writings of economist Joseph Schumpeter. He was best known for writing about the "perennial gale of creative destruction" that forever destabilizes capitalism. He thought those gales would inevitably undermine capitalism, since vested interests would fight back, which is why it's kind of odd that he's usually quoted, now, by people who like a more free-form system. But regardless of whether you think Schumpeter's gale is a good thing or bad thing, it's hard to argue that it exists. I was reading, the other day, about the Reader's Digest Association's second bankruptcy filing in the last five years. Once widely read and loved, this general interest magazine has struggled to be profitable in a world of digital content and niche advertising. Then there's RIM, which once owned the inbox-in-your-pocket market, only to see that category taken over by other players. It's attempting to claw back with a new generation of phones. Will it work? Who knows? No one stays on top for long, and whole industries see disruption. Since these industries tend to be staffed by people, those people find themselves tossed about by Schumpeter's gale. If you view such gales as inevitable, though, how could you build your career to deal with that reality? Could you build your career in a way that might make change almost ... exciting? Could you go windsurfing in Schumpeter's gale? I've been thinking of this lately as my husband and I have been pondering what sort of career advice we'd give our kids. Statements like "go into law, it's always a great field" seem hollow. We both value hard work, but there are plenty of hard working people who've seen their industries disappear. Hard work alone is not sufficient for thriving in the world we live in. 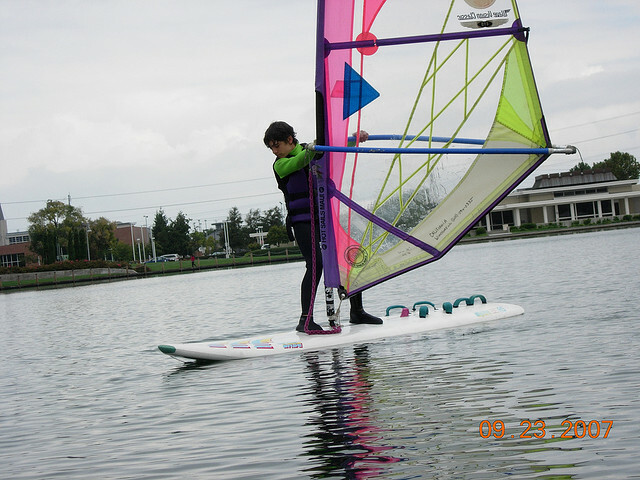 But here are a few ideas that might make windsurfing possible. 1. Be entrepreneurial. The world always needs people who identify problems others haven't, and who solve them in new ways that people are willing to pay for. Even if you never wind up working for yourself, you always want to look at a situation and be asking "How could I make this better?" and "Why would someone value that?" 2. Focus on visible results. In a field like writing, this is pretty straightforward -- if you want to see my work, I just send you a few links or mail you a book. Artists can shop around a portfolio. But obviously many other fields don't lend themselves as easily to outputs that can be pinned on Pinterest. The problem is that, in our attempts to build collaborative cultures and reward teamwork and such, we sometimes forget that it's hard to windsurf in economic gales as a team. Maybe you'll be able to bring your whole team with you to your next gig. But maybe not. Whatever project you're on, be sure to own enough of it that you can use that as your calling card. And if that's not possible in a particular project, propose another project on the side (see "be entrepreneurial," above). 3. Don't be a one-trick pony. OK, if your trick is broadly applicable in multiple industries, you could be a one-trick pony. But the point is that any one skill can become unnecessary thanks to new technology or new preferences. Always be learning related skills, and ways your existing skills could apply to different fields. 4. Nurture your network before you need it. At a party recently, I stumbled into a conversation between a man and a woman lamenting that a colleague had just sent them a LinkedIn invitation. I was confused as to what was so awful about this. The woman noted that every time she gets an invite it means the person is job hunting and will likely quit in the next 3 months. Many people don't think about building up and formalizing their networks until they actually intend to use them. It makes sense. We're all busy. But imagine if your network was so strong and useful that you were being told about great positions you could be interested in all the time. If you heard rumors of layoffs at your current organization, you'd just make a few phone calls and have people bidding for you. While others were worrying, you'd be daydreaming about your next opportunity. That's windsurfing in Schumpeter's gale.